I have always been a conservative. I voted Republican most of the time, affiliated with the GOP, and served proudly as a political appointee under two Republican presidents. I bitterly opposed Donald Trump’s candidacy and dropped my Republican affiliation once he won in 2016, figuring that the party would soon fall in line. I said as much in public, and my predictions were borne out. But it is only now that I have concluded that the break between conservative beliefs and the party that claimed to uphold them is complete and irreversible. Being a conservative has always meant, to me, taking a certain view of human nature, and embracing a certain set of values and virtues. The conservative is warier than her liberal counterpart about the darker impulses and desires that lurk in men and women, more doubtful of their perfectibility, skeptical of and opposed to the engineering of individual souls, and more inclined to celebrate freedom moderated by law, custom, education and culture. She knows that power tends to corrupt, and likes to see it checked and divided. Words like responsibility, stoicism, self-control, frugality, fidelity, decorum, honor, character, independence, and integrity appeal to most decent people. They come particularly easily to the admirers of thinkers from Edmund Burke to Irving Kristol. The GOP threw frugality and fiscal responsibility away long ago, initially in the Reagan years, but now on a stunning scale involving trillion-dollar deficits as far as can be forecast. It abandoned most of its beliefs in fidelity and character when it embraced a liar, cheat, and philanderer as its nominee and then as president. But something else snapped this week. Judge Brett Kavanaugh’s judicial philosophy as expressed in various statements and conclusions was, for the most part, pretty standard conservative fare, save for one tell-tale element: his ascription of very high levels of immunity and discretion to the executive. In this respect, what passes today for conservatism is anything but. Where traditionally, conservatives have wanted “ambition to check ambition” as Alexander Hamilton put it, Republicans are now executive-branch kinds of people. It is not surprising that Kavanaugh himself worked at a high level in a Republican White House. It was, however, in the epic clash over the testimony of Christine Blasey Ford that the collapse of conservatism in the Republican Party became most evident. Eleven men, most of them old, hid behind a female prosecutor wheeled in from Arizona because they could not, apparently, trust themselves to treat a victim of sexual assault with consideration and respect. So much for courage. . . . . when they did summon up the nerve to speak (during Kavanaugh’s turn) their questions consisted almost exclusively of partisan baying at the opposition. Genuine conservatives might have snarled initially, but would have, out of regard for the truth, tried to figure out exactly what happened to Ford 35 years ago, and whether the character of the man before them was what it was said to be. Perhaps the collapse of modern conservatism came out most clearly in Kavanaugh’s own testimony—its self-pity, its hysteria, its conjuring up of conspiracies, its vindictiveness. . . . we should expect stoic self-control and calm from a conservative judge, even if his heart is being eaten out. No one watching those proceedings could imagine that a Democrat standing before this judge’s bench in the future would get a fair hearing. 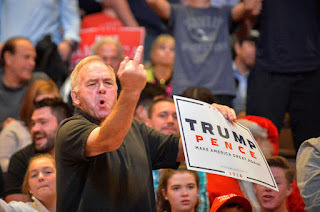 This was not the conservative temperament on display. It was, rather, personalized grievance politics. Real conservatives have always prided themselves on their willingness to stand up to their own kind in the name of moral principle. . . . . William F. Buckley took on the John Birch Society in the middle of the 20th century, and the anti-Semites in the conservative camp later on. In 1993, when Buckley had to choose between loyalty to Joseph Sobran, his long-time protégé and colleague at the National Review, and rejection of bigotry, principle won and he fired his friend. During the Ford and Kavanaugh testimonies, Americans watched the cranky maunderings of Senator Chuck Grassley and the spitting, menacing fury of Senator Lindsey Graham. The combination of calm strength and good humor that characterized the modern conservative icon, Ronald Reagan, was nowhere to be found. . . . [and] has been replaced by the sour meanness of a party chiefly of men, who build walls to keep the world out, erect tariffs to destroy free trade, despise the alliances that keep Americans secure, and sanction the deliberate plucking of babes from their mothers’ breasts in order to teach illegal immigrants a painful lesson. In such a world, decorum and courtesy are irrelevant. It is impossible at this moment to envisage the Republican Party coming back. Like a brontosaurus with some brain-eating disorder it might lumber forward in the direction dictated by its past, favoring deregulation of businesses here and standing up to a rising China there, but there will be no higher mental functioning at work. And so it will plod into a future in which it is detested in a general way by women, African Americans, recent immigrants, and the educated young as well as progressives pure and simple. The most we can do is point out the truths as we see them, and cheer on those who can do the necessary work. It is supposedly inconceivable that a genuinely conservative party could emerge, but then again, who thought the United States could be where it is now? And progressives, no less than bereft conservatives, should want this to happen, because the conservative virtues remain real virtues, the conservative insights real insights, and the conservative temperament an indispensable internal gyro keeping a country stable and sane.